I think we're all aware, and familiar with, the concept of the second novel in a trilogy being the weakest link of the series. Rebel Heart, however, for all its flaws, is actually a much stronger novel than Blood Red Road ever was. If we think back to Blood Red Road, it was nothing more than an engaging, fast-paced, and page-flipping dystopian novel. Yet, Rebel Heart, despite its page-flipping action, is also a much slower, deeper, and intoxicating tale. Yes, there were moments when I felt like pulling my hair out and crying into my pillow. Yes, there were characters I wanted to shoot down and plot threads I wanted to burn. Yet, this book was perfect. I can't think of any other way this story could have gone and when you step back and really think about this novel, disregarding your own conflicted emotions, you will come to see that Moira Young is an unbelievable author, for she lets her characters lead the story and that truly does make all the difference. Rebel Heart starts out with Saba, Lugh, Emmi, and Tommo on their way to a new, and better, life in the west. Saba, however, is tormented by dreams of Epona and she feels as if the spirits of the dead are walking with her. Thus, when she stumbles upon a small village with a woman who claims she can help, she takes her chances with the strange magic this woman claims to be able to control. Yet, before Saba can fully be cured, she receives a message – from Jack. Thus begins, yet again, a thrilling and tortuous journey to The Lost Cause, an inn in the north where Saba is set to meet Jack. Along the way however, Saba will be forced to confront her inner demons, her strained relationship with Lugh, and most dangerous of all, her own heart. I think what prevented Rebel Heart from being a 5 Star read were just a few plot threads that went haywire. For one, I found that the beginning of the novel, with Saba’s grief and guilt over the death of Epona, was remarkably well-written, but it was solved rather strangely, not to mention abruptly. In addition to that, Lugh, Saba’s brother, seems to be the ultimate downfall of this novel. It is evident that Lugh has undergone a terrible experience during his time with the Tonton, but we are never told what actually happens to him. Instead, we can simply watch as his relationship with Saba wilts away and while these sibling dynamics were brilliant, Lugh’s angst, rudeness, and constant anger simply wasn’t. If anything, he became an extremely annoying character and I felt like smacking him every time he opened his mouth. Lugh never undergoes any type of character growth throughout this novel and ultimately, he winds up remaining a flat character which was rather disappointing. Those qualms aside, I loved Rebel Heart. Moira Young’s conscious decision to make this a slower and more brooding novel was definitely the right choice as we are able to see some of the after-effects that the events in Blood Red Road have wrought upon Saba. Furthermore, we are privy to a whole new side of Saba, which only goes to further give her more depth than she already had. While Rebel Heart had its fair share of incredible action, I feel as if it was Saba more than the plot that drove this novel forward. Yet, I thoroughly enjoyed the crew of new characters we got to meet as well as the turn in relationships that we were able to witness with some of the older characters. It is hard to imagine just how firmly these fictional beings worm their way into your heart, but they really make a home there, immersing you, the reader, even more fully into this tale. In addition, there were plenty of jaw-dropping plot twists, unexpected reactions, and betrayals to keep this plot moving wonderfully, so fans of Blood Red Road will not be disappointed on that front either. Now that I have discussed my issues with this tale, as well as the change of pace, new characters, and the heart-pounding plot line, it’s time to turn our attention to the one aspect of this book I am sure everyone is eagerly waiting to hear more about – the romance. I know there are rumors floating around of a love triangle in this novel, but there isn't one! Yes, we do have another guy creep into Saba's thoughts, but this only happens during the last quarter of the novel. Furthermore, I hardly see this as a love triangle. In my opinion, a love triangle is a situation where the MC is torn between two guys, but Saba is not torn. Saba loves Jack, end of story. Does she make some terrible decisions in this book? Yes, she does. Is she conflicted over another man? Yes, she is, but not in a romantic sense. I may just be in extreme denial, but from my perspective, what occurs with the other man in this novel is a combination of many things and love is not one of them. So, while there isn't a love triangle in this, there is another prominent male figure during the last 25% of this novel which definitely makes this difficult to read and worrisome for the sequel. In all honesty though, I wouldn’t worry. Moira Young, more than just being a wonderful author, has proved with Rebel Heart that she knows what she’s doing. I found her characters and their reactions to every situation to be spot-on and while I didn’t particularly like the direction the last quarter of this novel headed and while I am worried beyond anything for the sequel, that doesn’t mean I don’t see the necessity and truth behind it. I think many authors would have steered away from the path that Young took, but I’m glad she took the more difficult – and frankly speaking, controversial – route. Yet, I must reiterate this, that when you step back and look at this novel without allowing your emotions to distort your perception of it, you can see that everything is just perfect. Yes, even the romance because although Jack and Saba aren’t together for the large majority of this novel, they always remain in each others thoughts and their love only grows stronger with their separation. 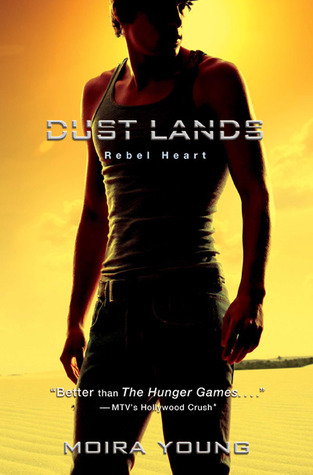 Overall, Rebel Heart is a novel I wound up enjoying much more than its predecessor, despite the fact that my rating for this is slightly lower than that for Blood Red Road. While I doubt I’ll be re-reading this installment as much as I will Blood Red Road, there’s no doubt about which book is the stronger one and it is refreshing to see such an original take on this plot line. I will warn you though that plenty of plate-smashing is there in the future of this story and once you finish this, you will spend a countless number of sleepless nights waiting for – and worrying about – the sequel, but it is so worth it. Rebel Heart is yet another wonderful installment from Moira Young and has made me a much bigger fan of hers than I ever was before. I doubt everyone will love this novel like I have, but I truly believe that if you look into the heart of Rebel Heart, you will only find something to love. A sequel being stronger than the first in the series? An impressive feat for sure! I'm delighted that you really liked this one, Keertana, in spite of your small quibbles with it. :) I liked the first in the series well enough but since you claimed Rebel Heart is far better... Well I must now, right? ;) Really, really great review! And I almost forgot to add, I despise the blurb on the cover of this! Stop with the comparisons, people! I barely got through the first book so I won't be reading the sequel. But I'm glad you still enjoyed this one. Great review! I haven't even read the first book, but I'm glad that the second one was even better than the first!! Great review! It's great to know that this one sounds even better than the first! Saba seems to be an awesome character. Thanks for the thorough review, Keertana! Yay for no Middle Book Syndrome! I'm glad you enjoyed this one, Keertana, even though there were a few slight problems. I think it's interesting that you liked this book more even though it was slower placed than Blood Red Road, that's usually the opposite case for me. Hopefully I'll still like this one! I'm also super intrigued about this 'path" that Moira Young took, and about how you said it was controversial. I pretty much love controversial stuff, so I'm really interested to see what direction the author takes this book in! For one, I found that the beginning of the novel, with Saba’s grief and guilt over the death of Epona, was remarkably well-written, but it was solved rather strangely, not to mention abruptly. Totally agree about Lugh. His character is the reason I knocked a star off of this novel, which I actually loved a bit more than BRR. It got to the point where I really couldn't take him anymore. Not a good reading experience. Your review is great though because it made me think about the book in a different way. I like your reviews quite a bit. Thanks Keertana! I HATE YOU! I'm dying to read this! I'm so glad you enjoyed it. I can't wait to dig into it myself. urggghh release date come faster! I just skimmed your review to get the gist of your feelings since I haven't read the first book. I do have it so I hope to read it soonish but I'm happy to hear the second book is good even if there are flaws. I never really know what to expect from a second book. Sometimes they feel like fillers and other times they are much better then the first. I'm glad this one was good! Yes! The thing with Lugh bothered me immensely! A huge part of the plot was connected to what happened to him while he was a captive, and yet, we were given nothing concrete. It seemed like too big a thing to be left unsaid, unexplained. One can assume, of course, and I understand why Young didn't go into graphic details, but giving us nothing wasn't a great solution either. Sorry, I'm rambling. Our ratings are the same and our opinions align 100%. I love it when that happens. Okay, I skimmed your review because I haven't read the first book, but you have me super curious about this ending given you said she takes a harder, more controversial route. I really want to know what happens now. MUST READ BLOOD RED ROAD KEERTANA! Lovely review. I felt exactly the same as you did about Blood Red Road - it was fun and fast paced but the plot wasn't all that complex. I'm glad to see that this one slows down a bit and delves deeper into the characters. Thank you for your comments on the love story, though they do make me nervous. I have a really difficult time separating my emotions from the characters, and it sounds like I may need to brace myself for some things that happen here. I have heard rumors of some controversial material, and I know it's going to upset me! But I do want to see where this story goes. Do you think this is one to pick up now? Or wait until book 3 is out to read? I'm all about Jack and Saba and their romance so it worries me a bit about another "prominent" male figure in the story. BUT it also makes me very curious as to who it is. There was one prominent (and mysterious) male figure in BRR that I was intrigued with...I wonder if it the same person.. Awesome review, Keertana. I'm so excited to be reading early reviews of this book at last! Sdfjssjdf THIS BOOK I CAN'T EVEN. I think I'm a much bigger fan of it than you are, Keertana, but I do agree with you--I loved the attention to Saba's internal struggle. I thought the you-know-what with you-know-who at the end was kind of weird, but I liked that the author wasn't afraid to do whatever the heck she wanted. Love the review, Keertana. I love how detailed and thorough you were so I completely get why you gave the book 3.5 stars. I still haven't read Blood Red Road because I'm a little wary about not being able to grasp the language. Still, I've heard nothing but good things. I'm glad that you feel that the sequel is in a way stronger than the first book. Okay, I loved BRR and so I need this one. Stronger? Oh yea... I so needs it like now! It's moving up my wishlist... to the top!